The Cubs' best defense Sunday night was answering incessant questions about moving on from their first World Series title since 1908. "Honestly, if you walked in our clubhouse, you couldn't have recognized we just came off winning a World Series," manager Joe Maddon said. "I mean that in a really good way. Their work was spectacular. "I think the page has been turned. It symbolically will be turned next week." Maddon referred to the raising of the 2016 World Series flag at the home opener on April 10 and the April 12 ring ceremony. 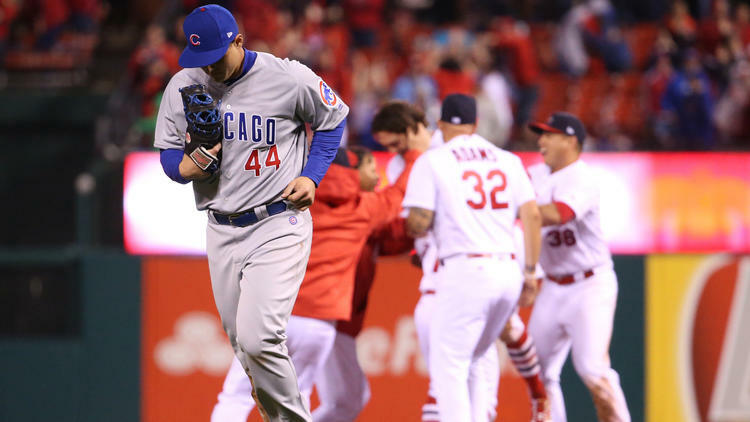 The drama carried over to this season's opener, won 4-3 by the Cardinals after the Cubs dramatically tied the score on a three-run home run by Willson Contreras in the top of the ninth. Randal Grichuk came up big twice for the Cardinals, hitting a two-run home run against Pedro Strop in the eighth and the winning single in the ninth against Mike Montgomery. Cardinals ace Carlos Martinez harnessed the Cubs with a 100 mph fastball and darting slider that produced 10 strikeouts and no walks in 7 1/3 innings. After blowing a bases-loaded opportunity in the eighth, Contreras launched the tying home run off reliever Seung Hwan Oh with one out in the top of the ninth. The blast traveled an estimated 414 feet at Busch Stadium. Oh hit Ben Zobrist to open the ninth, and Jason Heyward took advantage of a bobble by Matt Carpenter at first for an infield hit to set up Contreras' home run. After Montgomery loaded the bases in the bottom of the ninth, Grichuk drove in the winning run on a long drive to the left-center wall. Maddon made a gesture to his title-winning squad by starting Zobrist in right field, Heyward in center and Javier Baez at second base, with planned regular starting center fielder Albert Almora Jr. not in the starting lineup. "It's a tribute to the World Series," Maddon claimed. "That's it. Those are the guys who were on the field in the seventh game of the World Series so I wanted to, as a tribute to them, what they've done for us, put them on the field tonight. It's no more complicated than that." Maddon said Sunday's alignment could be used in the future, with an emphasis on rest for his players and for everyone to remain patient. The Cubs' poise at the plate was tested by the flamethrowing Martinez, against whom the Cubs looked as helpless as they did during their noncompetitive years. Kyle Schwarber started the Cubs' first two rallies but was left stranded after hitting a double with two out in the third after Martinez struck out Kris Bryant for the second time on a slider. Martinez escaped the first when Zobrist grounded into an inning-ending double play. After Anthony Rizzo's single in the first, Martinez retired 16 of the next 17 batters. Martinez struck out the side in the second, starting with a 100 mph fastball past Addison Russell. Martinez also threw a 99 mph fastball that seemed to rise as it zipped past Bryant to end the sixth. Martinez's dominance was so convincing that it didn't seem to matter what lineup Maddon submitted — even one batting order he revealed Jan. 10 prior to Cubs Convention. That batting order featured Jon Jay in center field and Baez on the bench. At the time, Maddon said he needed to be more convinced that Schwarber could handle the leadoff duties and was still pondering whether to bat the starting pitcher eighth or ninth. Photos from the Cubs' season opener against the Cardinals on Sunday, April 2, 2017, in St. Louis. 0 Response to "Cubs start title defense with wild 4-3 loss to Cardinals"